For our bus fans: Is it possible to ride a bus from The Bronx through Manhattan through Brooklyn and into Queens? What are some possible combinations? 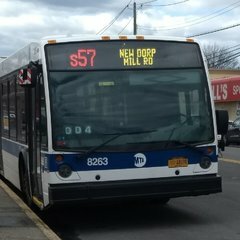 Bx15 to M15 to B39 to Q54/59. If that route ever excited, reliability would go down the drain. If that route ever existed, reliability would go down the drain. If that route ever existed, who the f*** would take it?!? Honestly it would most likely just be for fun and not actual, serious service. Hmpf, I wish the MTA had deep pockets like that to go about doing that.... Then again, it wouldn't go towards "actual" service anyway. Running a service for fun? Jokes aside, that’s a pretty bizarre idea on any level just to run a multi borough service. It’d serve less purpose than the “parliamentary trains” the UK train networks run since they don’t have the time to deal with that process of getting rid of them . I mean, frankly, the closest thing the would get to doing this is running older buses on fan trips and festivals and whatnot, don’t they (with transit museum) already do that to some extent ? Might've asked this before, but is there a single "M" route that goes into Bk, Q, or Bx? M100 to Riverdale before the cut in 1989. M32 before being renamed Q32 in the 90's. Not for fun, for profit....that's their way of getting tourists to get on and ride the buses, which often works.